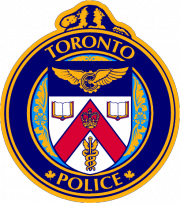 On June 4, 2008 Toronto's Guns and Gangs Taskforce along with many other police officers from around the country participated in taking down known criminal organization La Mara Salvatrucha 13 (hereafter known as MS-13) . More than 6,000 officers in 5 different countries participated in this international gang sweep. In the GTA alone, 22 warrant were executed, 17 alleged members of MS-13 were consequently charged with over 63 charges. Charges range from simple car thefts to conspiracy to commit murder. Canadian authorities do not take this criminal organization lightly nor do American officials and warn the public to be very cautious when dealing with these individuals as this is a very violent group of persons. The investigation continues today as our collegues make huge steps in arresting these individuals. However there is much more work to do and we would appreciate if anyone with information can contact us at one of our numbers located above or at Toronto Crime Stoppers 416-222-TIPS. The following individuals are suspected MS-13 members in the GTA area. 3) Participate in Criminal Organization. 11) two counts of Fail to Comply Recognizance. 10) Participate in a Criminal Organization. 3) Aiding – Fail to Comply Recognizance. 2) Possession Marihuana – For the Purpose Trafficking.